The newer pilots need to learn how to read the RASP weather maps and learn to plan how to fly from one turn point to another. The more experienced pilots should be helping the less experienced, just as we were helped (or wish we were helped), in own early days of Cross Country (X-C) flying. Following your entry, suggest what might be a good release point and which turn points might be usable on a short X-C.
for the benefit of the less experiences, limit one discussion to areas specifically within this “Short X-C Area”, in a new discussion, talk about your 200 or 500 km plan. Do NOT limit you discussion to only mountain tows. If it is possible to fly an X-C within the designated “Short X-C Area” on many days without a mountain tow. Any pilot with a bit of experience and motivation to help others, should look at the RASP, offer their opinion as to where to tow to, how high the lift might be, and which turn points might be chosen as a “local x-c” course for the day. Such posting will be appreciated by many. However, keep in mind that many of the newer pilots are shy about posting to the Forum, so you may not see the feedback publicly. Here is a graphic that details the Short X-C area. 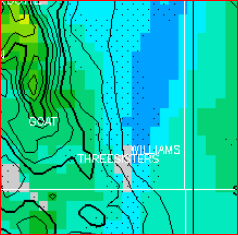 The white lines on the first graphic correspond to the white lines seen on the Williams 3 Day RASP maps; the turnpoints are shown on the Norcal 7 day RASP maps. 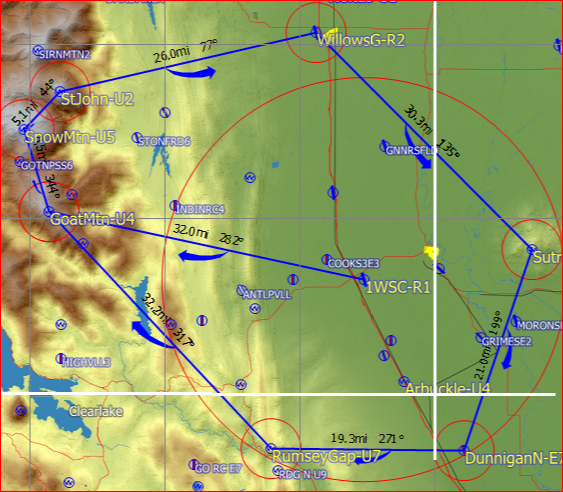 Included on the Williams 3 Day are 3 NM circles around each of the perimeter turnpoints, and a 20 mile circle around WSC (three nautical miles is the suggested turnpoint area for new pilots). This area is called the short X-C area. You may find it helpful if you download and keep the above images of the area in a handy place, to assist in your x-c planning. After reviewing the RASP maps and outlining a cross country route within the “area”, download the maps that validate your plan, then snip the corresponding area. See the appendix below to see how easy it is to do this. 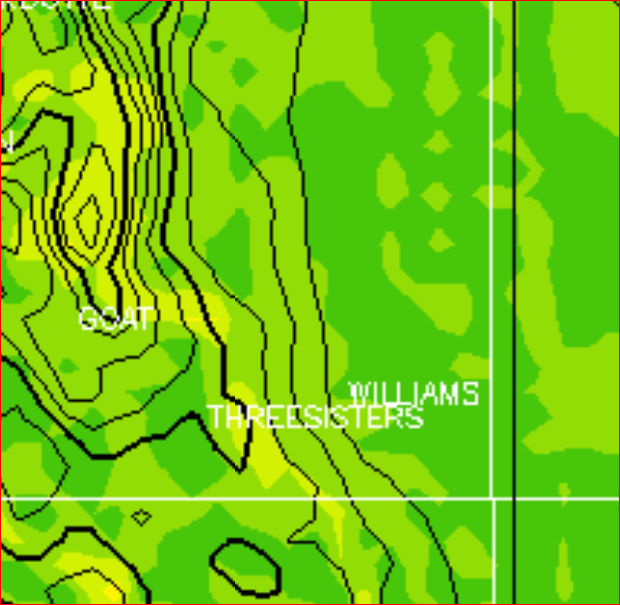 Info note: the black vertical line to the right of the longitude line east of Williams marks the edge of the RASP domain area, so don’t confuse that line with a line of Longitude. 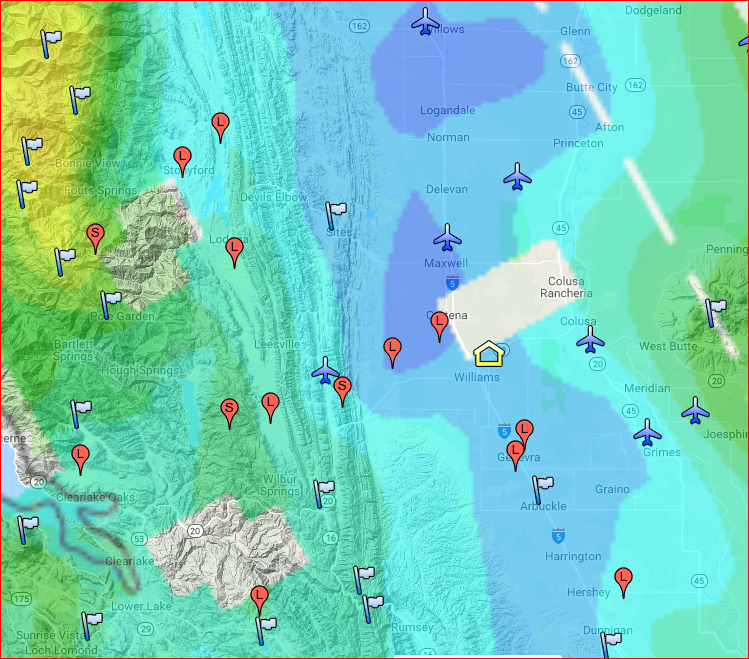 Note the distance from Willows to the south edge of the area is 40 NM and the distance from Sutter Buttes to Snow is 52 NM. This is about 15 % of the full area of the RASP map. Zooming in like this is a necessity! The area just within that 20 nm circle around Williams is 314 square miles, so we are talking about a very large flying area, even in this Short X-C Area. Limit the distance from home, so that it is easier to remain within glide distance of familiar landing areas. Provide a finite geographic area to predict the weather. Provide a finite list of turnpoints that will be used for the tasking. Provide a specific area in which flying conditions may be discussed, based on the weather forecasts. It is undoubtedly a good idea if pilots accomplish some sort of familiarization training with land out locations before attempting to accomplish even short X-C flights, especially if they are relatively inexperienced. Example of capturing the rasp maps and editing them for a short x-c.
Williams 3 Day RASP: On MY computer system (Microsoft, Windows PC) I first download the RASP image and the snip it. I display the downloaded image, enlarge it 62 %, then Snip it, using the sniping tool, and save that. To snip, I place the cursor on the “k” in black butte, the go to the lower right capturing the leading edge of the 3 in “39N” and place the bottom of the snip just below the hill at gold mines ( look at a rasp product and you will understand what I am talking about). I now know where to look on the RASP when I am planning my X-C for the day. If you do this a few times, you will find it takes very little time. 7 Day Norcal RASP: Check the box – “Display Turnpoints”. Display the map you want to use, and snip/ capture the area of your proposed short x-c area and then plan your x-c.
As for accuracy of each model… Andy has concluded that the program used on the newer (7 day rasp) is sometimes not as accurate as the older program, which is used on the Williams 3 Day rasp.